Sometimes it doesn’t take much, does it? 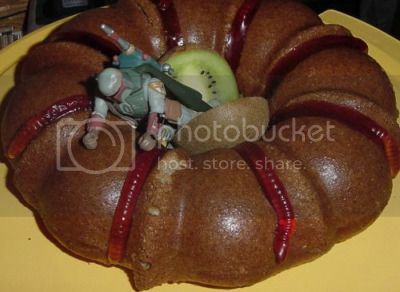 Look upon Jason‘s simple “Sarlacc Surprise” Bundt cake and enjoy the small spike in serotonin in your brain prompted by mild-to-moderate delight. That’s artistry, people. Also? A sticky action figure. The resale value on Ebay just went all to hell. Haha. Three out of the last five posts on here have been Boba Fett related. When the guy is on a roll, I’m not going to try to stand in his way.